Food for Smaller Parrots, such as Cockatiels, Lovebirds, Parrotlets, etc. The key to a good diet is variety. 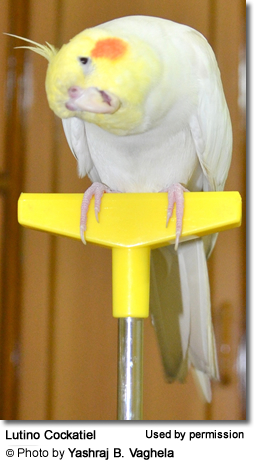 A cockatiel's diet should consist of a quality small parrot mix (some are listed below), supplemented with various fruits, green foods, millet spray, and occasionally some mealworms (or other forms of protein - as listed below). Ensuring a varied diet for our pet cockatiels may sound easier than it really is. 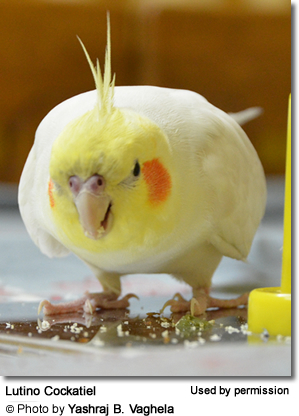 Cockatiels are known for their "pickiness" when it comes to trying out new food items. It is best if fresh foods and a varied diet is provided from early on. But if they did not have that advantage, it does time, patience and persistence! to get them to accept healthy food items. One of my favorite tricks is to place a shallow dish on top of their regular food dish (I found some that fit snuggly - so no soft food gets mixed into their actual seed dish). Alternatively, take out the seed dish and exchange it for one filled with fresh food items at those times of the day when your cockatiels are most likely to eat (usually first thing in the morning or in the evening). I would start with a good quality (if possible organic) dry food / seed mix. I would look for preferably "organic" or at least "all-natural" dry bird mixes. "Fortified diets" are not necessarily good as often inferior, artificial additives are used, which may have no health benefit at all or indeed may even be harmful. It is far better to buy unfortified mixes and add a good quality bird supplement instead. Dr. Harvey's Bird Food Mixes or Lafeber are convenient options that lack many of the harmful additives that are commonly found in commercial mixes and have a great variety of quality ingredients (including dried fruits, veggies, herbs / greens and even superfoods, such as bee pollen!) - in short: myriad nourishing ingredients that are not found in other commercially available bird mixes. However, our biggest grievance with their products is that they use sulphurated dried produce (a process which also requires chemicals), but it is very difficult to find mixes with unsulphurated fruits and veggies. You could just buy the seeds, nuts and grain mix and buy human-grade unsulphurated dried produce / greens as well as bee pollen and mix them in. Even organic trail mixes (WITHOUT CHOCOLATE!) work great. With a little creativity you can put a mix together that offers superior nutrition without the chemicals typically found in commercial brands. This bird food mix lacks the harmful additives that are commonly found in commercial mixes and has a great variety of quality ingredients that are not found in other commercially available bird mixes. You may want to ask your local store to add quality bird food items, such as Dr. Harvey's, to their product line. Oftentimes, bird stores are happy to oblige, which is far less likely to be the case with the large chain pet stores. Bird stores generally have a better selection of bird foods than pet stores, but they also carry those brands that contain harmful chemicals. Reading the list of ingredients is really important. The general rule is: if you can't pronounce it -- don't buy it! All ingredients should be natural and healthy. Another option: A good quality formulated diet. Vets often recommend Harrison's -- which is a good diet, but mostly available at vet's offices and, as is the case with pellets in general, acceptance may be an issue. Vegetables and fruits should be part of a cockatiel's daily diet. This includes apples, grapes, many garden vegetables such as spinach, watercress, field lettuce, poppy, chickweed, dandelions, carrots, corn on the cob, peas, endives and sweet potatoes. It is important to keep in mind that some companies add artificial coloring to their dried fruits and veggies to make them visually appealing.Only purchase naturally dried fruits without any sulfur dioxide, as this preservative is known to increase hyperactivity, aggressiveness, feather shredding or picking due to allergies. Sprouting or germinating is an excellent method (and most certainly one of the most cost-effective) of providing nutrient-dense (living) foods to birds. Even those that are less cooperative in eating their daily portions of fresh foods in many cases will enjoy eating sprouted seeds. Sprouting is easy -- this webpage has step-by-step instructions ... You can also germinate the sprouting mix - rather than going through the process of sprouting, which may be somewhat intimidating initially. Germinated seeds offer their own unique sets of valuable nutrition and are quicker to obtain and less likely to spoil. Additional proteins should be offered such as cottage cheese, hardboiled eggs or monkey chow. Peanuts are also a valuable source of protein -- however, peanuts are often contaminated with aflatoxin, a fungal toxin. Aflatoxin is carcinogenic and causes liver damage in birds and other animals. Roasting reduces aflatoxin but does not eliminate it entirely. North American peanut producers are currently working on eliminating contaminated peanuts from their products. Caution is advised when feeding peanuts. Some bird owners, opting to be on the safe side, are eliminating peanuts from their pets' diet.